If you are looking for an unbeatable location and a fun and friendly atmosphere, then book your stay at Holiday Hostel now to start your east European experience. Excellently located in the center of the city, Holiday Hostel welcomes its guests in a warm and welcoming villa. Our property combines comfort with good taste and a lot of facilities to ensure that your stay will be unforgettable . Holiday Hostel is a brand new hostel run by young and friendly staff who know exactly how to help you enjoy your trip and are looking forward welcoming you to Bucharest! 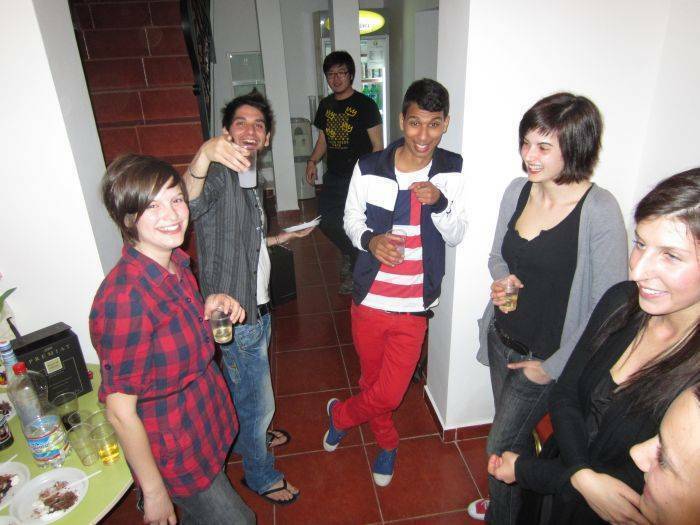 This newest backpackers & travelers hostel is provided with all the amenities you would expect in a first class hostel. The fresh design and modern touches of our Hostel compliment perfectly the charm of this historic quarter. Trip and tours can also be booked at our reception, so don't hesitate to ask! We accommodate our guests in comfortable dorms, waiting for you to fill your batteries between your roaming adventures and parties. Holiday Hostel has 4 dorm types available – one double private room, 3 rooms with 6 beds, one 8 bed dorm and another room with 13 beds for a total of 41 people. In our spotlessly clean bathrooms you can take a hot shower 24 hours a day and in our fully equipped modern kitchen you can sit down, cook, enjoy your free breakfast, watch some TV or just talk to your new buddies. One place that really gives Holiday Hostel its special character is our unique, common room. It is the heart of our hostel - is a living room, lounge, a place to relax, listen to music or sing it, read a book or write one, watch a movie, surf the free internet, play some games, meet cool new people, meditate, share your thoughts, fall in love... you choose what's going to be for you! Bed sheets and linen are provided and all rooms come with security lockers, reading lamps, air- conditioning units. At Holiday Hostel we offer you a hundred and one services to make your stay here as comfortable as possible. Perfect location to visit all the main cultural and architectural attractions of the city, including the People Palace, the National Library, Unirii Square and Unirii Park, Historical Center with the Old Court and the best nightlife & clubs - all in a easy short walking distance. In our neighborhood you can find everything a traveler might need - pharmacies, ATMs and exchanges, supermarkets, shopping center, mall, souvenir shops, pubs, as well as places to eat for everyone's taste. Receptionist on duty 24/7 for your safety and to check you in whenever you arrive. Check in any time. Rooms will be available at ~ 4pm. If you arrive early (after 5 a.m) you can store your things on our FREE locked luggage room until your room is ready. However, we'll appreciate if you'll let us know your ~arrival time. For group bookings, please contact us! Payment in full is expected on arrival. Take the Express bus no 783 from the Airport (Baneasa or Otopeni) to Unirii Square, the last stop (don't forget to buy a valid card before taking the bus). Because Unirii Square has 2 stops, make sure that you get off at the last station. From there, you'll be able to see in the right the huge building of the People Palace and in your left the big Unirea Shopping Center and Dambovita river. Between them is Unirii Boulevard, the street that you have to fallow. After 5 minutes of walking and passing by Mircea Voda Boulevard, you'll have to make a slight left on Anton Pan Street, a right on Parfumului street and then, at the first intersection, another left on Romulus Street. You will find us at no 79. Step in and enjoy the relaxing atmosphere! 1. Go to "Gara de Nord" subway station and get on the Yellow Line going to Republica/Pantelimon. At the 7th stop, get off the train at Unirii Square (Piata Unirii) and go through the passage to the second subway station. Get off from the tunnel and take a left, climb the stairs (the second ones) and then make a right. Now, you should be in front of Unirii Shopping Center having behind you the People Palace. Make a right, pass close by H&M store and make a left on Unirii Boulevard having in your right Dambovita river and then, the National Library . After 5 minutes of walking and passing by Mircea Voda Boulevard, you'll have to make a slight left on Anton Pann street, a right on Parfumului street and then, at the first intersection, make another left on Romulus Street. You will find us at no 79. 2. Getting out from the Train station building (the main exit), you should make a right and then cross the street (Dinigu Golescu). Buy your card and get the bus no 123 to Unirii Square for 14th stops. Your last stop is "B-dul Mircea Voda"(after the Square). Now, you should be able the see behind you the People Palace (the second large building in the world). Cross the street and walk close to the buildings till you'll meet Anton Pann Street. At the second intersection, make a left on Romulus Street. You will find us at no 79. Step in and enjoy the relaxing atmosphere! If you arrive outside the times, you will have to get a taxi or ask us for a pick-up transfer. use the landmarks if you want to ask for directions. Bus: 783 (from the airport).